SALT LAKE CITY (AP) The Oklahoma City Thunder were the talk of the offseason after adding two more All-Stars to the roster. None of that mattered against a deep Utah Jazz team built to defend. Rudy Gobert had 16 points and 13 rebounds to lead the Jazz to a 96-87 victory over the Thunder. Utah didn’t trail after taking a 13-12 lead in the first quarter. Oklahoma City’s All-Star trio of Russell Westbrook, Paul George and Carmelo Anthony were bottled up in the first half by an active Utah defense. By the time George and Anthony got going, the come-from-behind climb was too steep. Anthony scored a game-high 26 and George added 22. Westbrook was held to six points on 2-for-11 shooting to go with 13 rebounds and nine assists. He was held to single digits just twice in the two previous regular seasons. ”We knew how dynamic those three guys can be,” Utah’s Joe Ingles said. ”We’ve seen them with their individual teams, but now putting it all together is probably a scary thing if they all get going. We tried to make them take tough shots … contest every shot that we possibly could. The Jazz opened up a 38-19 lead in the in the second quarter thanks to a 27-7 run spanning the first and second quarters. 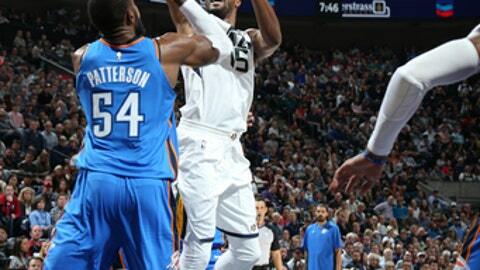 Ingles scored 19, including five 3-pointers, and Derrick Favors continued his early-season success on the inside and the perimeter with 13 points. Ricky Rubio made plays for others and hit big shots to finish with 16 points. Gobert’s double-double was his third in three games. ”We talked about trying to have energy tonight on the second night of a back-to-back,” Jazz coach Quin Snyder said. ”Obviously, we had a really good night and the score reflected that. ”The NBA, no matter what you do, is a make-or-miss league. We were fortunate that they had some shots that didn’t fall. When we didn’t give them second shots, our defense was pretty solid. That’s who we are. That’s who we want to be. A defensively-minded club. The Thunder cut the lead to single digits on multiple second-half occasions thanks to George and Anthony, but never truly recovered from a horrid first half in which they shot 30.2 percent from the field and went 2 for 15 on 3-pointers. The Jazz answered with a run of their own each time, shot 49.4 percent for the game and never gave up the lead. ”When you have a new team coming together, it’s different for everybody,” Thunder coach Billy Donovan said. ”Paul, the way he scored in Indiana, is going to be different here. Same with Carmelo. Thunder: Oklahoma City scored at least 26 points in each quarter of the season-opening win against the Knicks. It was held to 14 in the first quarter Saturday. … Thunder cut the lead to 48-44 early in the second quarter, but never got any closer. Jazz: Rodney Hood did not play after suffering a mild left lower leg strain against the Timberwolves on Friday. Rookie Donovan Mitchell started in his place. … Raul Neto made his debut after missing the first game with a hamstring injury and getting a DNP on Friday. The Thunder transition with the additions of George and Anthony went smoothly in the season opener as those two and Westbrook combined for 71 points. Things didn’t come as easy against the Jazz. ”It’s different when you’re accustomed to being a rhythm guy, having to create offense off the bounce and get yourself in a rhythm off the dribble,” George said. ”Whereas the other night I was getting a lot of catch and shoots, so that rhythm is going to be a little different now. So just getting prepared for that, all the open opportunities that I’ll have and now knowing how teams are going to play and adjust to Russ. Thunder: Host Karl-Anthony Towns and the Minnesota Timberwolves on Sunday. Jazz: Visit Blake Griffin and the Los Angeles Clippers on Tuesday.